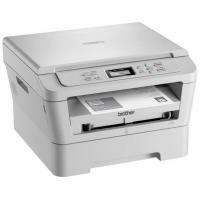 The Brother DCP 7057 is a laser printer for small and home office users. The printer has a small footprint and it can fit into any limited office space. It can print high-resolution monochrome documents with the help of its Brother DCP 7057 toner cartridges. Printer boasts USB connectivity option and compatible to almost all the operating systems. The printer weighs 12.9 kg and measures 527 x 510 x 440 mm. The printer has 250-sheet input tray and a large control panel at the front. The control panel contains one 2-line display screen and a bunch of function and navigation buttons. The maximum resolution of the device is 2400 x 600 dpi. The output tray of the printer can hold up to 100 sheets at a time. The printer can handle A4 size paper media and can print on card stock, transparencies, labels, glossy paper, envelopes, and matte paper. The drum life of the printer is 12,000 pages and the toner cartridge is capable of printing up to 1000 pages. The printer also features 16 MB of internal memory. This monochrome laser printer has a very small footprint because of its unique design, that makes it most suitable small workgroups. However, the lack of wireless connectivity, or say limited connectivity options can be a huge drawback for the printer. The Brother DCP 7057 is a basic all-in-one monochrome laser printer for small office users. The printer does not have any high-end feature, however, it provides high-resolution prints with the help of its Brother DCP 7057 toner cartridges. For connectivity it only has USB 2.0 port. The Brother DCP 7057 printer is an all-in-one laser printer. The printer falls in the budget printer category and has some interesting features. Like the other Brother printers, the Brother DCP 7057 printer is shipped with the Brother DCP 7057 Toner Cartridges. At times you notice smudge marks along the sides of the paper or on parts of the printed paper. These smudges may be caused due to jammed paper pieces within the printer. Many other times, the printer will be unable to carry the print command as an entire paper is jammed within the machine. When pieces of paper tear and get trapped in the printer, and while printing the ink from the Brother DCP 7057 Toner Cartridges gets smudged over the pieces and the printed paper gets these smudge marks. This error can be solved by clearing the jammed paper. If the paper is jammed inside the ADF cover then lift the cover and inspect for any foreign objects like bits of paper, dust etc. If you are able to locate the paper of bits of paper, careful and firmly remove these pieces. You must check the paper quality that is being used for print. Usually a lighter quality of paper can often cause jams as it gets caught up in the printer. You must use a heavier quality of paper in this case. Just like the Brother DCP 7057 Toner Cartridges are available online, you can purchase different qualities of papers online as well. Make sure that when you use a heavier paper, you change the media setting accordingly. If the paper is stuck near the toner cartridge, be careful while removing it. Do not move the unit by hand. Gently pull the paper out. Q. What causes the ‘Cartridge Error’ error message to get displayed on printer screen? What is the solution to this problem? A. The probable cause of ‘Cartridge Error’ error message is that the Brother DCP 7057 toner cartridge is not installed correctly. If the toner cartridges are not installed properly, the probable solution is that you pull out the drum unit and remove the toner cartridge, then re-install the toner cartridge in the drum unit. This will resolve the issue. Q. If ‘Duplex Disabled’ error message is displayed what are the probable causes and solutions of this error? The duplex tray is removed or is not correctly installed. To resolve this, you must carefully put the duplex tray into the machine until it clicks into place. The back of the machine is not closed completely. To resolve this, Close the back cover of the machine. Q. What to do in case of grey background on the paper? Conditions like high temperature and humidity can increase the amount of background shading. So, check the machine’s environment. Make sure that you use paper that meets your specifications. Put in a new Brother DCP 7057 toner cartridge. Put in a new drum unit. Q. What can be done if ghost prints appear on the paper? Make sure that you choose the correct media type in the printer driver or in the machine’s Paper Type menu setting. Rough-surfaced paper or thick print media may cause this problem. So, make sure that you use paper that meets your specifications. Choose Reduce Ghosting mode in the printer driver. The fuser unit may be contaminated. Call Brother dealer for this. Q. May I know the page yield that the compatible Brother DCP 7057 toner cartridges (TN2010) provide? Q. My Brother DCP 7057 printer is displaying the message Drum End Soon. Can I continue to take prints for a couple of days and then replace the drum unit? A. Yes, you can continue to print and replace the drum unit later. At the same time, please note that the quality of the print may not be very good. Q. I want to replace my Brother DCP 7057 toner cartridges. Should I power down the printer before proceeding with it? A. No, please do not power down the printer ever while replacing toner cartridges. Q. Are Brother DCP 7057 toner cartridges environment-friendly? A. Yes, these cartridges are environment-friendly as basically they are recycled original Brother toner cartridges which are collected and sent to factories for the process of recycling. The remanufactured cartridges are then restocked with ISO standard premium ink which as good as the original. These measures reduce plastic waste created by printer cartridges and therefore these toner cartridges can be termed environment-friendly. Q. Is the print quality affected if the corona wire is not clean? And is it difficult to clean it? A. Yes, the print quality can be affected if the corona wire becomes dirty. It can also make the printer display errors like low ink, toner not installed properly, etc. even though that may not be the case. To dispense with these errors, you have to take out the toner and clean the corona wire. It isn’t really difficult to do that; you just need to ensure that you don't touch the corona wire. Q. I think I didn’t remove the sealing tape of the toner while replacing the TN2010 toner cartridge in my printer. Now I’m getting the message ‘Toner Ended’ when I try to take a printout. What should I do now? A. The presence of foreign bodies inside a printer does cause such problems. You need to remove it right away. Switch off the printer and take out the toner cartridge. Remove the sealing tape of the toner, reinstall the toner and turn the printer on. Q. I just bought a new Brother printer for my office. Will it be ok if I take out the Brother DCP 7057 toner cartridge from my current printer and install it in the new one? A. No. It’s not advisable to swap toner cartridges from one machine to another as it can result in error indications like Replace Toner, Toner Ended, etc. and/ or malfunctioning. Also, Brother printers control their image quality to offer the best print quality by monitoring toner consumption. If a partially used toner cartridge is installed, the printer cannot recognise toner consumption correctly. Q. I want to put the Brother DCP 7057 toner cartridge back into the drum unit of my printer. (I’d removed it to solve paper jamming problem). How would I know if it’s done properly? A. While putting the toner cartridge back into the drum unit, you should hear it lock into place and the green lock lever you’ll see there should lift automatically. These occurrences will indicate that you inserted the cartridge properly. Q. How can I prevent multiple sheets of paper from feeding through the printer at a time while printing? A. You need to first remove all papers from the paper tray and then straighten the pile properly for that. Q. Can I continue printing with the Brother DCP 7057 toner cartridge by enabling the Toner Continue Mode? Will it affect the quality of printouts? A. Yes, you can continue printing with Brother DCP 7057 toner cartridge by enabling the Toner Continue Mode. However, the print quality may turn poor if you select this mode as it means you’re printing beyond the graded life of the toner cartridge.